As we begin a new year, it’s always a good time to take stock of how various aspects of your business are performing and what you can do to improve upon any deficiencies. When you’re doing this, don’t overlook the role that your IT help desk plays in your organization. Is it performing as best as it can? To be able to change, you need to be able to benchmark. You can’t do this by guesswork. Having a clear set of KPIs in place will enable you to track the performance of your help desk. Key metrics can keep all your help desk staff accountable for its performance and successes. Your help desk serves a specific purpose – to help your internal and/or external clients with a range of information technology issues. But even if your help desk staff are doing just that, are the clients left feeling satisfied, or is the experience frustrating? You should review your operational level agreements and service level agreements annually to determine if the service you are providing is meeting the expectations of your customers. Skills in information technology on their own aren’t enough to be a suitable help desk operator. You need to make sure you are selecting candidates who have good interpersonal communication skills, can display empathy and patience, and can communicate complex information clearly and concisely. The right people can make or break the success of your help desk. If you’ve ever had the experience of calling any sort of customer support and have to re-tell your story over and over because the operator isn’t reading the notes on your file or, worse, the notes were never made on your file in the first place, you’ll know just how frustrating it can be. You can improve the user experience significantly by being vigilant about this one facet of your processes and procedures. Operators should always read the ticket notes, and comprehensive notes should always be included on someone’s file. Investing in training for help desk staff will allow them to answer questions confidently, develop their skills and knowledge and customer service abilities. They can also keep abreast of current trends and issues in their field. When a widespread issue, such as an outage, presents itself, the help desk can end up fielding dozens, even hundreds, of identical calls. 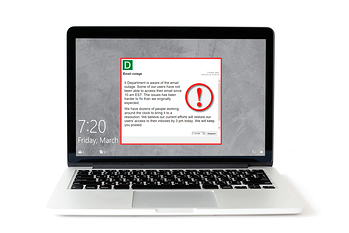 With DeskAlerts you can take the pressure off the help desk by sending a pop up message to every single user advising them of the issue, what course of action is being taken and an estimated restoration time. You can send ongoing alerts as the situation advances.